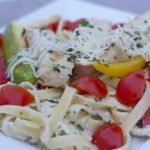 This chicken vegetable fettuccine alfredo recipe is so special to me because it was the first homecooked dinner I made for my hubby almost 11 years ago. I remember I spent hours trying to decided on the perfect dinner for movie night at home. It had to be something light, yet filling. I wasn’t ready to break out the soulful, throw-down type meals. Fresh always looks and tastes best so I knew I wanted something with lots of fresh veggies. This dish just won me over and him too! All of the colorful vegetables look so nice together and the homemade Alfredo sauce is divine! If it’s warm outside, I really like this with grilled chicken & vegetable but cooking it on the stovetop works well too! 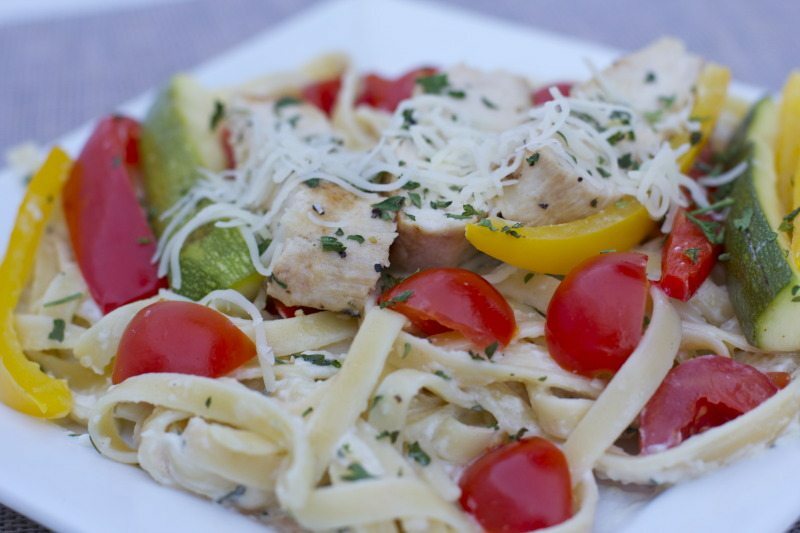 Watch me make this chicken vegetable fettuccine alfredo from start to finish! Tender vegetables, seasoned chicken and fettucini noodles tossed in a homemade alfredo sauce and garnished with fresh tomatoes, parsley and mozzarella! This chicken vegetable fettuccine alfredo is so yummy!! Add salt, onion flakes and minced garlic to season the water. Add the fettuccine noodles and cook until al dente. Do not overcook. When noodle are done, toss with butter and parsley. Bring ¼ cup water to a simmer in a large skillet. Add vegetables and cook just until barely tender. Do not over cook. Salt to taste. Melt butter in a grill pan. Cook chicken breast until done. In a medium sauce pan, melt 3 tablespoons butter with olive oil. Add in heavy cream, garlic, parsley, parmesan, and white pepper. Remove from heat. Sauce will thicken as it cools. Toss pasta with Alfredo sauce and place on a plate. Top with vegetables, chicken, & fresh tomatoes. Garnish with mozzarella and parsley. ~TIPS~ Use your favorite vegetables! I love broccoli and fresh tomatoes! If Alfredo sauce is too thin, let it simmer uncovered or let it stand. Sauce will thicken as it cools. If Alfredo sauce is too thick, thin it out with a little chicken broth or reserved pasta water. Jazz up the Alfredo sauce with mushrooms or fresh minced onion! Amazing!! Your blog us my new cook book. Thanks for ALL the go to recipes. If you have a cook book, I want it. If you dont have one yet, please make one. I will buy it. Awesome recipe! Will never use store bought Alfredo sauce again. My husband loved it! I used all the recommended veggies and added shrimp with the chicken. It was awesome! Enjoy your recipes! Keep it up! Girl, I made this tonight and my Husband and 5 year daughter loved it so much. It was flavorful, and the presentation was great. Nice and Colorful. I have introduced your site to all of my family…Please keep up all of the great work.